A smiling face with curved eyes, open mouth and a single drop of cold sweat. Upper teeth are shown. 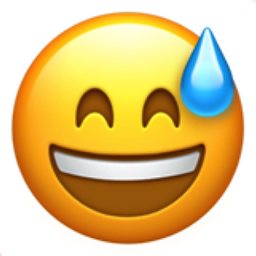 Aside from the drop of cold sweat, this emoji is identical to the Smiling Face with Open Mouth and Smiling Eyes. The drop of cold sweat displays slight stress and can often be a precursor of diaphoresis (Face with Cold Sweat).